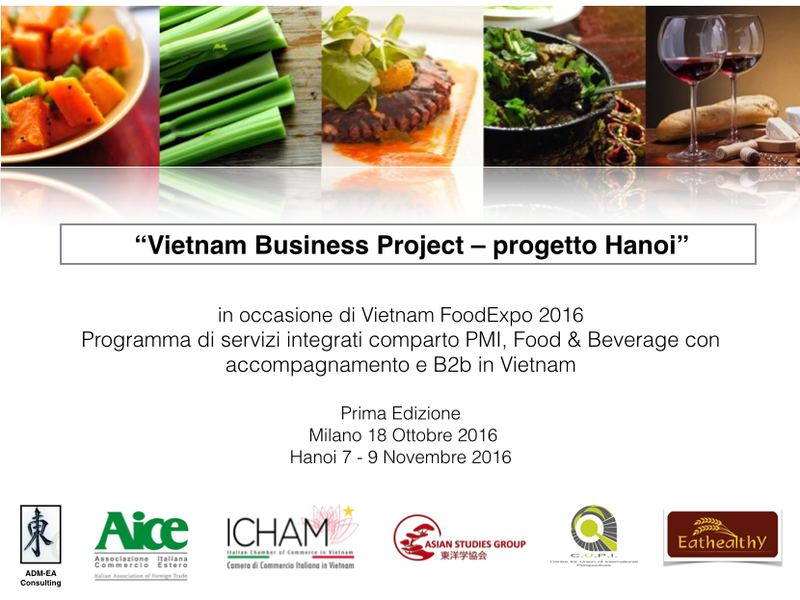 ADM-EA Consulting is pleased to announce the creation of a group for the food and beverage industry for the Vietnam market with the work program called “Project Hanoi”, which aims to set up integrated services for globalization, as well as training and consulting services for industry sectors with the involvement of institutional and operational partners. -Direct matching with importers and operational development of commercial dynamics. The group proposed and coordinated with Milan from our consulting practice with the involvement of operational and institutional partners with proven experience in Italy and in Vietnam including AICE Italian Association for Foreign Trade and ICHAM Italian Chamber of Commerce in Vietnam. The specialized training is coordinated by Asian Studies Group Italy in collaboration with the law firm De Masi Taddei Vasoli. The food segment is done by the consolidated partnership with EatHealthy LTD Hanoi, regarding configuration of the trade matching content and operational support to the B2B on site. -November 2nd and 3rd, Delivery of the schedule of appointments with importers in Vietnam for each participant in the mission. For those who request it during registration, it will be possible to evaluate displacement of Ho Chi Minh City at the trade fair (Vietnam Food Expo 2016) as both an exhibitor and a visitor. We will put you in touch with a manager for the exhibition at the fair. Thanks to the inclusion of the services mentioned in the project activities, supported by the Fund for Specialized Training and Internationalization of C.U.P.I. (Centre for Union of International Perspectives), the union can be fully funded at zero interest in installments from €125.00 monthly rate for 12 months, making the initiative sustainable to any interested party.